H1N1 (referred to as “swine flu” early on) is a new influenza virus causing illness in people. This new virus was first detected in people in the United States in April 2009. Other countries, including Mexico and Canada, have reported people sick with this new virus. This virus is spreading from person-to-person, probably in much the same way that regular seasonal influenza viruses spread. 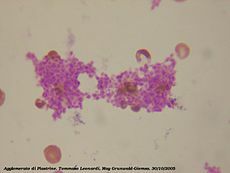 Human blood smear: platelets. This slide has been stained with MayGrunwald Giemsa, and observed with a 100x objective in oil immersion.